therefore an ISO9141-2/ISO14230-4 car can use the SAE J1850 pins and vice versa. The list below is but a few of the multiplexing systems in use today. Each system has its differences but for the most part they operate in a similar manner. We will take a brief look at each system including lab-scope waveforms of bus communications. Chrysler Collision Detection, CCD, was one of the fi rst widely used vehicle-wide multiplexing protocols used in the US. Introduced in 1988 on the Dodge Dynasty and Chrysler New Yorker, CCD was originally used for transmission controller to engine controller communications and data sharing. Soon thereafter, body control functions were added to the CCD bus. Bias can be provided by either the BCM, PCM, ETAX, VIC or VTA. Any module can provide termination and the PCM may provide backup termination. If PCM and TCM are the only modules the TCM provides Bias and the PCM provides termination. The termination resistor resistance should not be either 0 ohms or infinity. Without termination, bus voltage will be 5.0 volts on one wire and 0.0 volts on the other. CCD bus termination resistance can be measured with an ohm meter (battery disconnected) at either CCD pin at the DLC. Because the number of termination resistors can vary, an exact resistance specification is not possible. However, the resistance should not read 0 ohms (shorted) or infinity (open). Without termination, bus voltage will be 5.0 volts on one wire and 0.0 volts on the other, as opposed to the proper 2.51 volts on CCD- and 2.49 volts on CCD+. Remember when testing the CCD bus that it uses a floating ground, not vehicle ground. 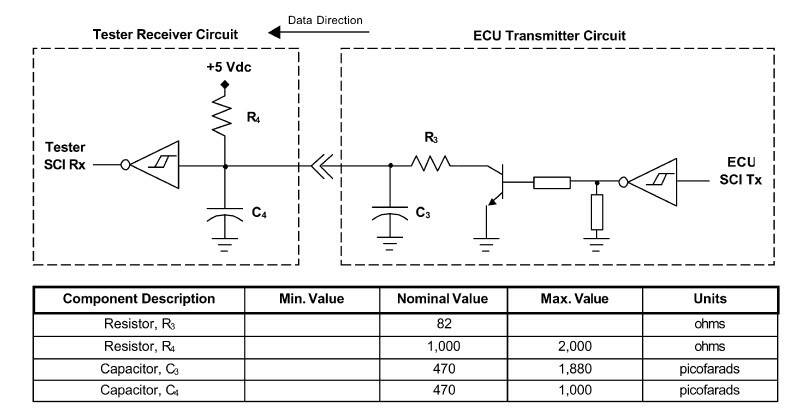 To see an accurate representation of the bus voltage on the lab scope you must connect across CCD+ and CCD-, not CCD+ to ground. The two wires of the CCD bus are connected in parallel; however, the manner in which the connections are made varies. Either standard splices may be used, or the bus can be connected at a joint connector or splice pack. 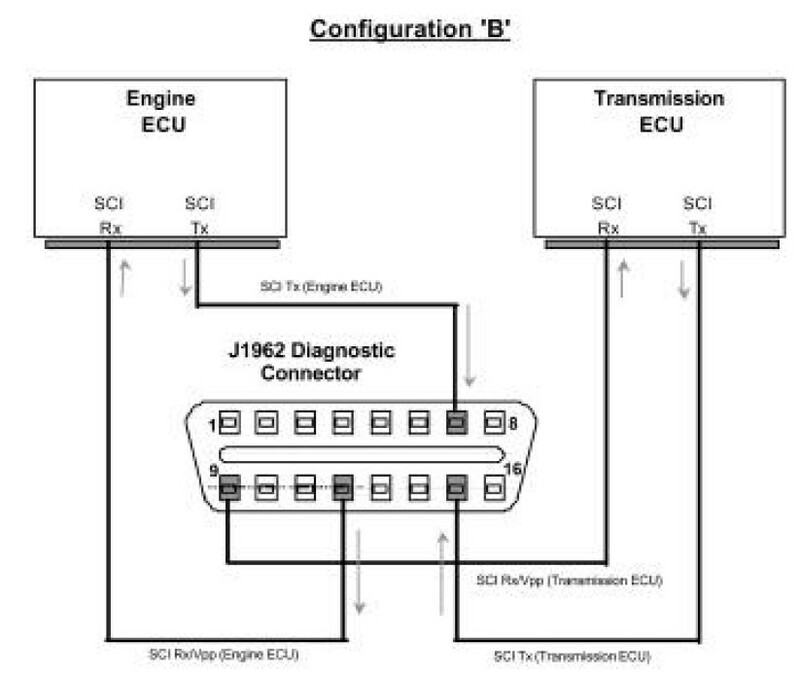 The joint connector can make bus diagnosis significantly easier by having access to all modules on the bus in one location. Splices, on the other hand ,can be located anywhere on the vehicle. Introduced in 1998, replaced CCD as a Body Protocol. A vehicle will have either CCD or PCI, not both and PCI is a Single Wire Network. PCI Bus Speed 10.4 kbps and can support up to 32 modules or nodes. It is used as a global OBD-II scan tool interface. Below is an example of Chrysler PCI communication as viewed on a lab scope. This waveform was captured at pin #2 of the OBD-II DLC. The PCI bus can communicate key off as long as one or modules are still active. The waveform will have an amplitude of 7.0 volts to 7.5 volts. A loss of power or ground to an individual node should not affect bus communication. Only that module should be effected. However, an open ground could cause a back feed of voltage to the rest of the bus, potentially interrupting communication to the whole bus. Resistance values determine the module’s dominance on the bus. The lower the resistance, the higher the priority of the module. These are typical values and should not be used for actual diagnosis. Actual specifications can be found in your service information system. Here are some tips to remember when testing these PCI circuits. Each module can transmit and receive data simultaneously. Message Header - Is one to three bytes in length. which communicates at slightly less than 8 Kbps. between low and high voltage levels to generate signals. PCI bus low voltage is around zero volts, and high voltage is around 7.5 volts (half of charging system voltage). The low and high voltage levels on a PCI bus are generated by means of variable-pulse width modulation to form signals of varying length (see illustration). Each up or down square is a “bit,” and the bus can communicate with up to 10,400 of these pulses every second. use a good fast O-scope set to the 20 volt scale reading in milleseconds. If the bus is shorted to power or ground, the scope trace will tell the tale with a dead flatline, either at 12 or 0 volts. 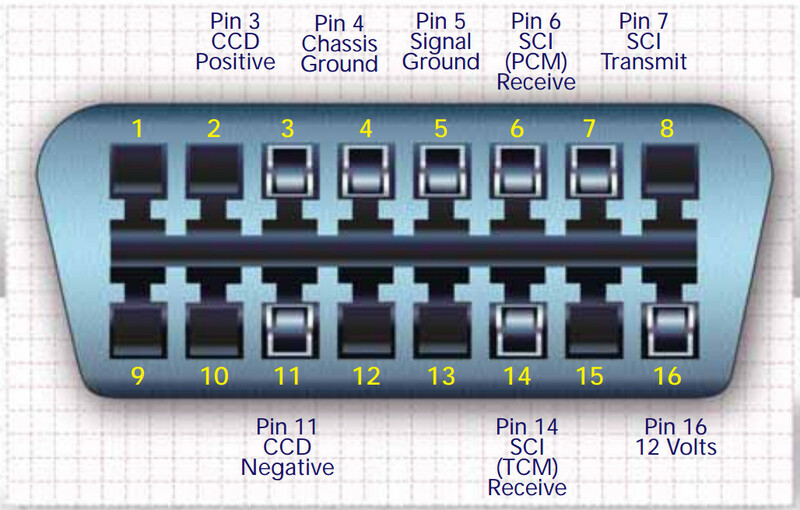 PCI Bus messaging uses Variable Pulse Width Modulation (VPWM). What that means is that both the state of the bus and the width of the pulse are used to encode bit information. A zero"bit is defined as a short low pulse or long high pulse. A one bit is defined as a long low pulse or a short high pulse. A byte is a series of bits. Imagine bits as letters that make up words and bytes as words that make up a message. SCI stands for Serial Communication Interface. 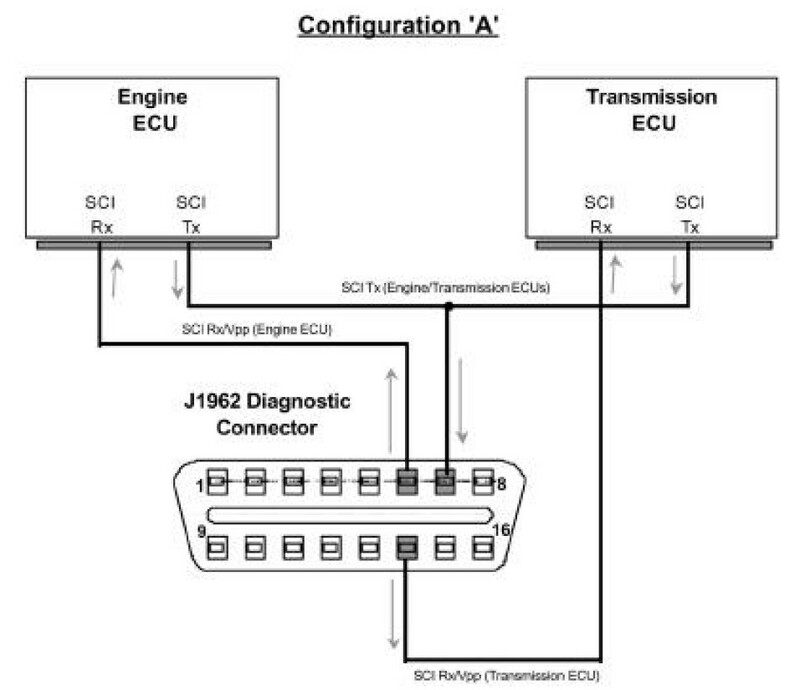 SCI is a diagnostic interface, not a network protocol and allows scan tool communication with PCM when bus is dead. SCI or Serial Communication Interface is for scan tool communication only. SCI is not a bus or a network protocol. Since SCI is not part of the CCD or PCI bus, scan tool communication is still possible when the bus is dead. On PCI bus vehicles, enhanced and OE scan tool communication takes place on the SCI interface. Global scan tools communicate on the PCI bus. a. Configuration 'A'—For Configuration 'A', connector pins 6 and 14 shall be multiplexed between SCI functionality and ISO 15765-4 CAN functionality under software control. SCI connections to pins 6 and 14 shall not electrically interfere with ISO 15765-4 CAN operation. Both pins must transition simultaneously between data link types when requested. 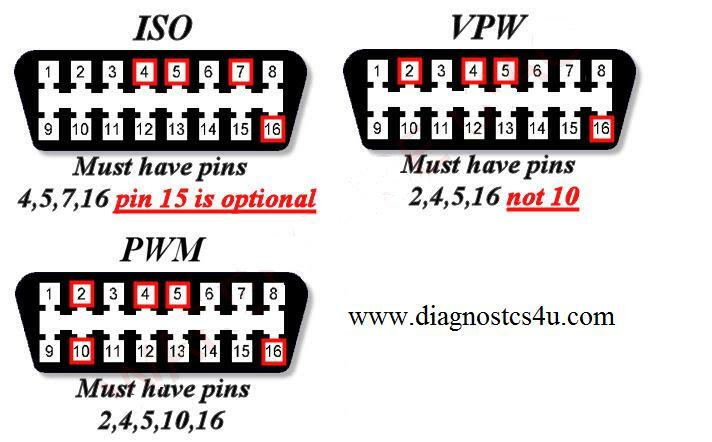 When the SCI mode is selected by the tester, both pins 6 and 14 must support SCI transmit with Vpp flash strobe function under software control. The default settings for the SCI channel function are 7812.5 bps with flash strobe 'OFF'. Connector pin 7 shall function as either an SCI receiver, or an ISO 9141-2 bi-directional transceiver under software control. SCI connections to pin 7 shall not electrically interfere with ISO 9141-2 operations, and shall be able to be pulled to either vehicle battery or 5 V DC under programmable control. b. Configuration 'B'—For Configuration 'B', connector pins 9 and 12 shall be configured for SCI functionality. When the SCI mode is selected by the tester, both pins 9 and 12 must support SCI transmit with Vpp flash strobe function under software control. Either connector pin transitions independently with SCI mode enabled. The default settings for the SCI channel function are 7812.5bps with flash strobe 'OFF'. Connector pins 7 and 15 shall function as either an SCI receiver, or an ISO 9141-2 transceiver under software control. SCI connections to pins 7 or 15 shall not electrically interfere with ISO 9141-2 operations, and shall be able to be pulled to either vehicle battery or 5 V DC under programmable control. For additional details regarding the multiplexing of the Vpp flash strobe requirements during a flash reprogramming session, please refer to Section 9 “Reprogramming Requirements”. 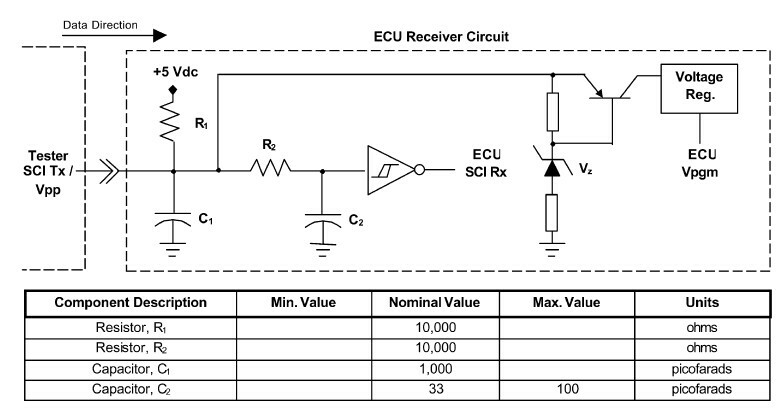 ECU Receiver/Transmitter Reference Circuits—The following figures depict functionally equivalent SCI receive and transmit circuits for an ECU. SCI RX LINE—The ECU receive circuit shall contain provisions to support SCI communications as well as Vpp flash strobe requirements multiplexed on the same line by the diagnostic tester. The tester must provide adequate pull-up resistance as shown. Asynchronous data transmission implies that each data frame shall be transmitted individually. This section defines the grouping of data bits that comprise an SCI data frame. A data frame is defined as one complete transmission of information delineated by the start of frame (start bit) and end of frame (stop bit) identifiers. These start and stop bits define the boundaries of a single data frame for the receiver to properly interpret. The data frame size shall be defined as ten (10) bits in length (i.e., one start bit, eight data bits, and one stop bit with no parity). a. One (1) Start Bit:One start bit with logic “0” (low) for one bit time duration. The start bit is defined as the first binary element transmitted in the asynchronous transmission of a data frame. It is used to uniquely identify the beginning of a data frame transmission to synchronize the receiver to an active session. b. Eight (8) Data Bits:Eight data bits transmitted from Least Significant Bit (LSB) to Most Significant Bit (MSB). The data bits comprise the byte or character value contained in the data frame bounded by the start and stop bits. c. One (1) Stop Bit:One stop bit with logic “1” (high) for one bit time duration. The stop bit is defined as the last binary element transmitted in the asynchronous transmission of a data frame. It is used to uniquely identify the end of a data frame transmission to return the receiver to an idle condition. d. No Parity Bit:No parity bit in the default data frame. Therefore, no parity checking is available in the transmitted data frame. Ford’s variation of J-1850 is called Standard Corporate Protocol or SCP. SCP uses a two wire twisted pair bus and is the most common network protocol used on late model Ford passenger vehicles. The signal has a 0-5 volt toggle and the SCP+ and SCP- signals are mirrored. Take a look at the signals below.